Whether you’re suffering from the common cold or the whoooooa-that-was-a-lot-of-whiskey-last-night cold, you can probably find the cure at the bottom of a bowl of pho, and probably definitely if that bowl of pho is one of these bowls of pho, the 10 best ones Chicago has to offer. 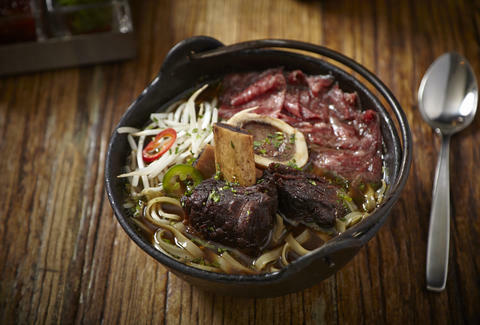 This just might be the fanciest bowl of pho in Chicago/ever, as Sunda’s take on the dish is loaded with bison short rib, bone marrow, and sliced Wagyu. It's pretty different from what you’ll typically find at Vietnamese joints, but that doesn’t mean it’s not an excellent decision if you’re craving something hot and carb-y. The addition of rice noodles, sprouts, basil, mint, and cilantro lighten up this meat-heavy soup, creating a great balance of flavors. Pho gets the fine dining treatment at this Vietnamese-French fusion restaurant in the Gold Coast. 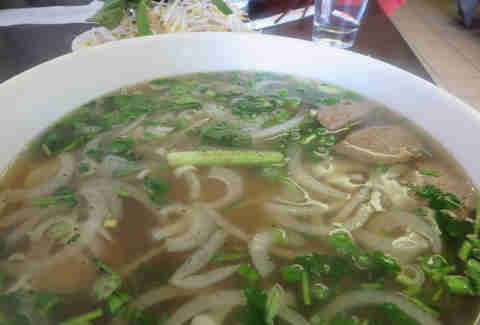 Its bowl of pho is on the smaller side (be sure to supplement it with a few appetizers or an entrée from the main menu), but this pho is absolutely worth ordering. The oxtail broth lends an elevated yet authentic flavor and the paper-thin slices of beef tenderloin are perfectly cooked. 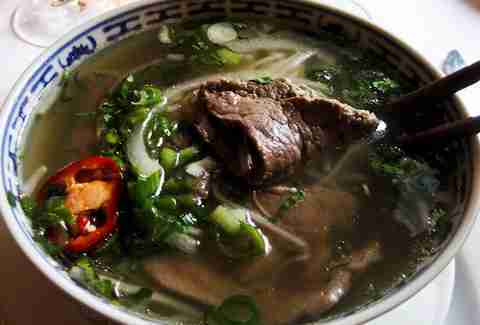 Pho arch enemies Tank Noodle and Pho 777 are consistently ranked as the top two places to find pho in the city. However, the menu at Pho 777 includes a nice variety of pho options and the restaurant policy allows you to cool down any pho mouth burn with beer or wine you brought yourself. Schlitz, anyone? Rejoice: you can score a cheap, authentic bowl of pho without making the trek to Argyle St. LD Pho is known for serving large portions and offering up viable beef-less options. Go for the pho ga xe or “shredded chicken noodle soup” if red meat isn’t your thing (we don’t get you but to each their own). 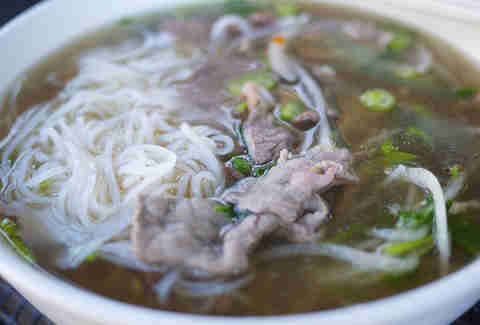 Beef pho purists will also be satisfied with the pho tai: a simple, hearty bowl packed with generous pieces of sliced beef. If Tank Noodle is closed (it's closed on Wednesdays), head right across the street to Pho Viet. Actually, head to Pho Viet even if Tank Noodle is open: The pho at this restaurant is delicious, flavorful and criminally under-recognized. Just be sure you pronounce the word “pho” properly (phonetical spelling = “fuh”) when you order... and don’t forget to supplement your bowl with a smoothie. If you're a pho virgin, Urbanbelly is where you want to lose your pho-ginity. The restaurant’s mushroom pho uses ‘shrooms and tofu for the vegheads out there (we still don’t get you), plus plenty of jalapeño and Thai basil gives this pho a nice kick. Oh, and thanks to the use of rice noodles, it also happens to be gluten-free (don't get you guys either). Okay, we know what you’re thinking: another Uptown restaurant that serves amazing pho? But hear us out: Uptown Pho is another Uptown restaurant that also sets itself apart by being one of the most vegetarian-friendly eateries in the area. And while the vegetarian pho is definitely the main attraction here, the banh mi sandwiches are also worth the trip. Best part of Pho & I? They’ll deliver bowls directly to you, meaning you can slurp one down without changing out of your sweats or venturing out into the snow. Fans of this place rave about the chicken pho, a slightly lighter (but still satisfying) alternative to the usual beef soup. Google “best pho in Chicago” and you’re sure to find Tank Noodle high up in your results. This Uptown staple offers up several takes on its signature pho in a large space -- opt for a big bowl of #43 if you’re looking to stick with a safe choice, or get adventurous (like, really adventurous) and order #50. Don’t say we didn’t warn you. We love the high quality meatballs added to the steaming bowl of beef pho at this Downtown Vietnamese powerhouse, but don’t expect the sort of massive, meal-in-a-bowl servings you’ll find at Uptown’s Vietnamese restaurants. This is definitely more of an appetizer. That’s not a bad thing, though -- it just means you’ll have room for an order of Saigon Sisters' caramel bacon wings afterwards. Zara Husaini is a lifestyle writer in Chicago who loves carbs, sugar, and cheese, but hates eggs. Follow her @zarhus.